F 5.9 easy – feel flat though at least not so snargly any more. 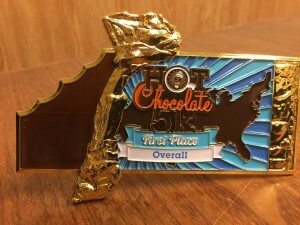 S 10.6 with 5 at 10 mile race effort – I figured 5k was going to be a bust anyway so may as well double up workouts Sat/Sun and salvage something from this week – great run with friends. S 6.5 warm-up – I was just trying to run the 5k course pre-race but got totally lost and was freaking out a little worried I’d miss the start – end up at the startline with 10 minutes to spare and frazzled. Total 34.3 miles for the week (half of the week before). I signed up for this race a few weeks ago just to get the sparks going again after CIM. 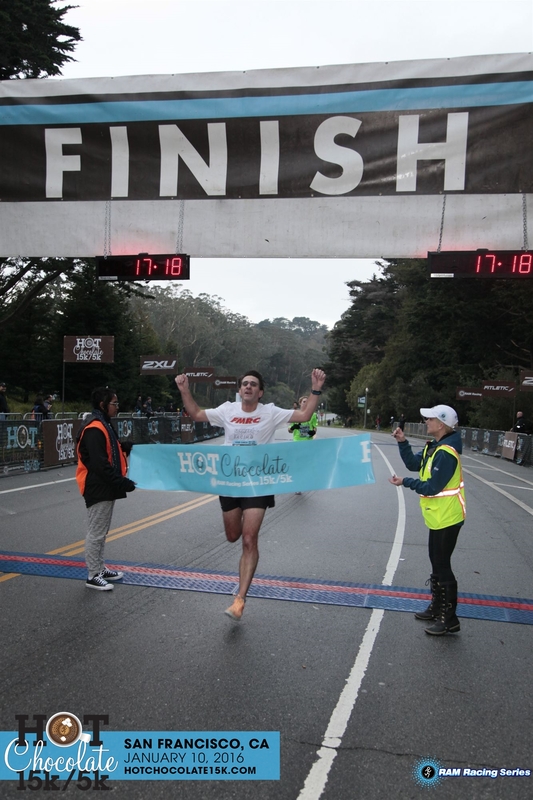 It runs through Golden Gate Park and is VERY big (~5000 runners) for a 5k but surprisingly for so many runners – past results show few sub17:30 runs – no prize kinda race. Course is a little hilly. My mark for this race was a young guy from my running club that I’ve never actually raced before but I’ve seen his times and he seemed to be about my speed. I see him at the startline but decide to avoid eye contact and stay in my own zone. Confidence was low as my week’s race-prep for this race sucked royal but I had the mentality of giving it my all regardless. Startline is like a mid-sized marathon start with corrals released every few minutes – I had to submit a qualifier race to get permission to start in first corral. 7:30 am – GO! I don’t push it up the hill right off the start and I’m counting half dozen up ahead including Brian (my mark) up near the leader – I’m a little surprised he’s up there as I we were running around 17 mpm 5k pace and I though he wasn’t quite that fast. By the top of the first hill a gap has grown and a leader group of 5 has pulled away from me. Then a long down hill and I find I can close the gap and tuck into the group. It doesn’t stay a group for long and positions change several times with the front 4-5 runners up and down a few hills – I once ease ahead of Brian on an uphill and he passes me back on the next downhill. After Mile two the course drops down and does a U-turn – a downhill u-turn on a slick wet road is a tough u-turn to do right at full speed and 3rd place in front of me slips off his feet but is back up again going just before I catch up. There’s a good ½ mile climb from the u-turn with a ½ mile flat part after to finish off the race so I hold on pushing up the hill and although I pass by the guy that fell – Brian in 2nd was still a good margin ahead with 1st place a little farther. I was thinking he might be weaker than me on the uphill since I passed him last time on the uphill but the gap stayed to the top and he didn’t come back. Time to move – I muster up an extra gear on the flat part and start moving to Brian and before I know it I’ve passed him and the leader is coming back to me too so I just keep that extra gear all the way up to the lead. I don’t keep the lead long as that leader comes back with a bigger extra gear and storms by me at a speed I don’t think I can match. But then he stops moving ahead – the gap goes to a constant as the finishline approaches so I put down an all out sprint to storm by him hoping he can’t match it. I look up and see two holding up a finishline ribbon and I sprint full speed between them raise up my hands and bust through it. 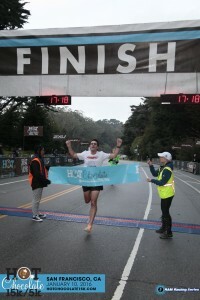 My first ever finishline ribbon to break – it was pretty cool – I’m looking forward to seeing the picture. 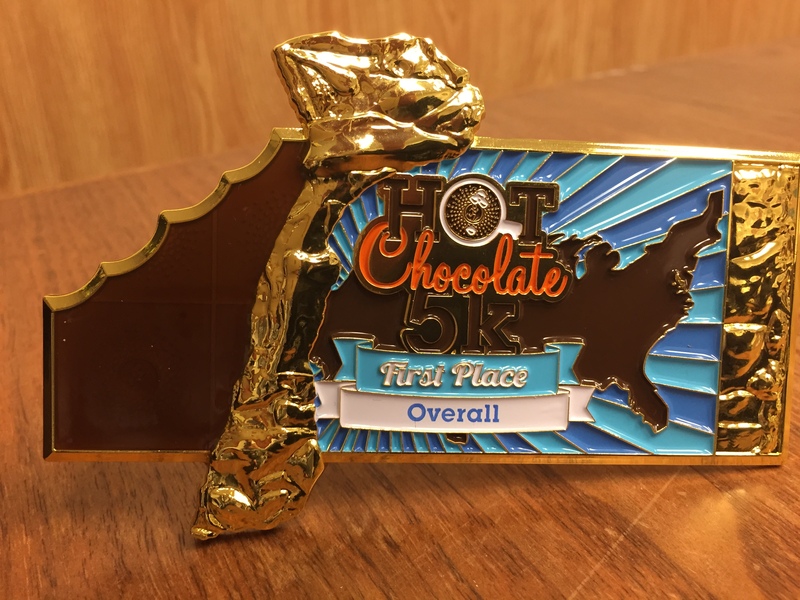 The prize for first place was a medal that looks like a chocolate bar and as it turns out 2nd place was only 15 – so I guess I kinda took candy from a baby :). After I thanked Brian for dragging me out faster than I might have gone – that really set me up perfect to steel away the win which was a very cool way to end off the week. Next up – Foster City 10M for a dual with Mr. Tim Keenan (it’s always fun having a mark). Marathon specialist - although occasionally stray into things longer or shorter or with multi sports that I am less good at.